We are so very excited to announce that the creator of Click n Curl and owner of Casual Panache, Inc., Kim Nimsgern, is going to be featured in The Mom Inventors Handbook: How to Turn Your Great Idea into the Next Big Thing by best-selling author Tamara Monosoff! 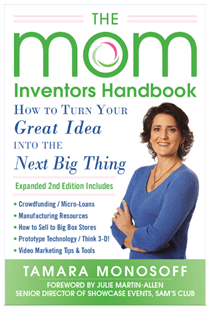 The latest edition of Monosoff’s book, The Mom Inventors Handbook gives step-by-step advice to do-it-yourself entrepreneurs on how to create, fund, market, distribute and sell their products. Kim used Monosoff’s first book to help create and find a market for the Click n Curl, and is very passionate about Monosoff’s work. Get your copy of Tamara Monosoff’s newest edition of The Mom Inventors Handbook on April 2nd, 2014!